Yen and Swiss Franc are so far the strongest ones for this holiday week. But trading is rather subdued in Asia, as part of the region are still on holiday. Activity will likely remain low in European session with Germany, UK and Swiss on holiday today. The markets might come back to life again later in the US session though. For the month, it’s obvious that Yen and Swiss Franc are the strongest ones on risk aversion, globally. Euro is the third strongest as somewhat helped by resolution in Italy budget. Australian Dollar led other commodity currencies lower. Dollar has been mixed despite all the US political headlines. Technically, USD/JPY’s break of 110.75 fibonacci level now put 109.76 support into focus. 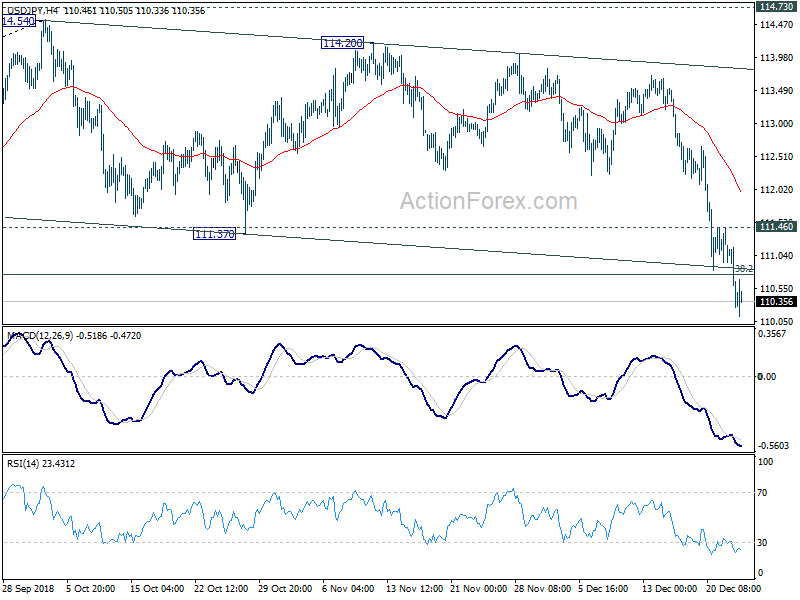 Decisive break there will confirm bearish trend reversal. There is still some distance away, but EUR/JPY might have a take on 124.08 key long term support. 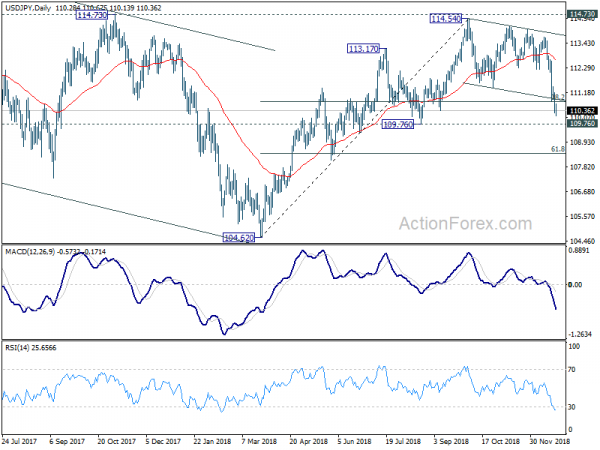 GBP/JPY, now at 140.21, is already eye equivalent key support at 139.29. Reactions to 139.29 in GBP/JPY might shed some lights on how deep USD/JPY and EUR/JPY could fall to. Australian Dollar is another interesting one to watch. AUD/USD, now at 0.7043, is close to 0.7020 low and break will resume down trend from 0.8135 to 0.6826 key support. EUR/AUD, now at 1.6194, is also heading to 1.6357 resistance and break will resume medium term up trend. US stocks suffered another round of deep selloff in thin holiday trading on Monday. DOW closed down -2.91% or -653.17 pts to 21792.20. S&P 500 dropped -2.71% and NASDAQ lost -2.21%. Treasury yields also tumbled with 10-year yield down -0.043 to 2.749 and 30-year yield dropped -0.025 to 3.003. 3% handle for 30-year yield is more vulnerable than ever. For DOW, 38.2% retracement of 15450.56 to 26951.81 at 22558.33 was taken out firmly with today’s decline. And DOW finally caught up with S&P 500 and NASDAQ. There is prospect of recovery due to oversold conditions. But any consolidation would be brief as long as DOW stays below 22339.87. DOW is now likely correcting the 10-year up trend from 6469.95 (2009 low) to 26951.81 (2008 high). Thus the retracement levels from 15450.56 become rather irrelevant. Instead, we’ll look for support between 38.2% retracement of 6469.96 to 26951.81 at 19127.73, and 55 month EMA (now at 20153.19), with 20000 psychological level in between. The first leg of the long term correction could only finish after touching this support zone. US S&P Case-Shiller house price and Richmond Fed manufacturing index are the only features today. Daily Pivots: (S1) 109.97; (P) 110.26; (R1) 110.53; More..
USD/JPY dropped to as low as 110.13 so far and there is no sign of bottoming yet. The break of 38.2% retracement of 104.62 to 114.54 at 110.75 and current downside acceleration now increases the chance of bearish reversal. Intraday bias is stays on the downside for 109.76 support next. Break will target 61.8% retracement at 108.40. On the upside, break of 111.46 resistance is needed to indicate short term bottoming. Otherwise, outlook will stay bearish even in case of recovery. In the bigger picture, price actions from 125.85 (2015 high) are seen as a long term corrective pattern, no change in this view. Apparently, such corrective pattern is not completed yet. Break of 109.76 support will start another medium term down leg to 98.97/104.62 support zone. ON the upside, break of 114.73 resistance will likely extend the rise from 98.97 through 118.65 resistance.